NASA launched the two Voyager spacecraft to Jupiter, Saturn, Uranus, and Neptune in the late summer of 1977. Voyager 1's closest approach to Jupiter occurred March 5, 1979. Voyager 2's closest approach was July 9, 1979. 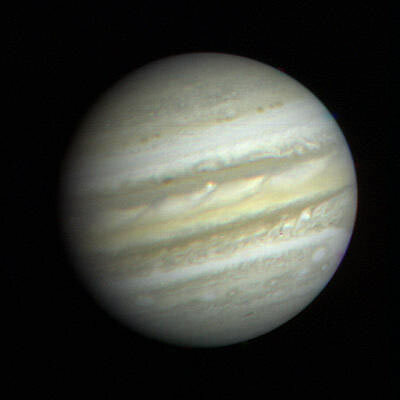 Photography of Jupiter began in January 1979, when images of the brightly banded planet already exceeded the best taken from Earth. Voyager 1 completed its Jupiter encounter in early April, after taking almost 19,000 pictures and many other scientific measurements. Voyager 2 picked up the baton in late April and its encounter continued into August. They took more than 33,000 pictures of Jupiter and its five major satellites. Although astronomers had studied Jupiter from Earth for several centuries, scientists were surprised by many of Voyager 1 and 2's findings. They now understand that important physical, geological, and atmospheric processes go on - in the planet, its satellites, and magnetosphere - that were new to observers. Discovery of active volcanism on the satellite Io was probably the greatest surprise. It was the first time active volcanoes had been seen on another body in the solar system. It appears that activity on Io affects the entire Jovian system. Io appears to be the primary source of matter that pervades the Jovian magnetosphere -- the region of space that surrounds the planet, primarily influenced by the planet's strong magnetic field. Sulfur, oxygen, and sodium, apparently erupted by Io's volcanoes and sputtered off the surface by impact of high-energy particles, were detected at the outer edge of the magnetosphere.